For those who have a brain, this post was put up for intelligent minded people. The loud booms that are being heard around the planet, is from the Earth's crust, separating from the mantle. Sometimes, there are flashes of light, which is the result of static electricity, being released after the release of the pressure. Once it reaches 60% will go through a magnetic reversal. There are, three types of magnetic reversals.The first type takes about a thousand years, one will never feel it. The second type is 500 years, you won't feel that one either. The third type, is in a 24-hour period. The last one we had was the third type happened approximately 13,000 when they discovered the famous frozen mammoth. The animal had tropical vegetation in its stomach that froze within a 24-hours in Siberia, tropical vegetation does not grow in Siberia at that current time, right? 3600 years ago, when Moses was exiting out of Egypt. China reported three days of darkness in the Middle East we reported three days of sunlight. China reported the Sun came up in the morning and then reversed and went down exposing three days of darkness. In the Middle East, it was reported the sun went down and then came back up exposing three days of sunlight. This was cause, in which the planets rotation slow down to a stop. The planet did not go into a magnetic reversal, but it did stop rotating for 3 days. This is what caused the separation of the Red Sea in the Bible. 3600 years before that event. The day of Noah, when the Planet stop rotating and vocal-ism took place. Compressing the water tables around the world and releasing freshwater and billions and billions of metric tons simultaneously, not only to the land. Also the Pacific and Atlantic oceans. As a result the planet went into a rapid climate change. Because the flooding throughout the world. All of these examples have been proven through geologist and researchers. Now the magnetic poles is the weakest it's ever been recorded. A 180-degree physical inversion of the planet's solid crust around its molten core. We are in a 26000 year cycle of expansion. This is what's causing the Earth's enormous cracks , volcanoes , earthquakes and sinkholes, throughout the world. Thus, leading to major cataclysmic events and extreme physical earth changes. It is believed that this could take place if another planetary body, such as a 'rogue planet' a Stellar Core or similar cosmic anomaly passed in close proximity to the Earth as Planet-X System is doing, providing enough torque for such an event to occur. Many believe this has occurred in the past and is due to occur again in the not so distant future. Some speculate that this potential rogue planet will be passing Earth in the year 2024 on its 3,657 year orbit around our sun. As of now we are at 3651 in the year 2019 , meaning approximated 2024. This lines up perfectly with September 23rd 2017 the beginning of The 7 year Tribulations and its relation to Revelations 12. In the Bible it is referred to as Wormwood, Planet Of The Crossing, The Great Destroyer, The Great Dragon, Planet X and Nibiru. This event will have the potential to reshape earth and life, as we know it. The second would be a reversal of the Earths magnetic poles called Geomagnetic Reversal in which the positions of magnetic north and magnetic south become interchanged as the Earths magnetic field weakens. 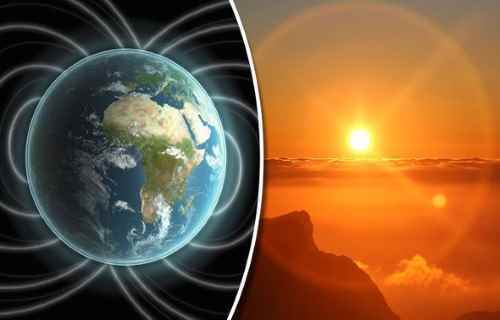 A reversal of the magnetic poles is much more likely, as it has occurred several times before in Earth’s history according to paleo-magnetists. Evidence for this is provided by measurements of the orientation of magnetic materials in sedimentary and volcanic rock. Research indicates approximately 200 reversals has occurred. Scientist and author, Gregg Braden refers to this shift as, “the shift of the ages” where Earth’s magnetic field decrease to zero point, consequently reversing the magnetic flow, bring humanity into an age of Enlightenment [ and Ascension ] as well as transformation into the 5th Dimension. This shift is also thought to bring about periods of rapid cataclysmic changes. Many link this event to the year 2024 and the end of the ancient cycle of 2012. If you are reading this post and agree with it. Feel free to go to my channel And subscribe. As well as read, what I'm about. Thank you may God continue to bring you the light ! Just my insight on this subject, Earth Changes.